Today I had the opportunity to finally visit one of Thousand Oaks most revered BBQ restaurants: The Thousand Oaks Meat Locker. Unbeknown to me, this little shack is within walking distance of my Mom’s place. I had no idea. It took me two attempts to find this place today, and I had a google map. It’s a little restaurant and you can only read the sign from right in front, which makes it hard for people who drive (i.e. Everyone in L.A.) to find it. I’ve had their food on several occasions when my old work would have lunch catered for the team. They do the standard barbeque fare including tri-tip, chicken and ribs. Unfortunately, they only stay open until 5pm, so this is strictly a place for lunch. So I was pretty happy about finally going to this place. I was in the mood for a sandwich that was simple and tasty. 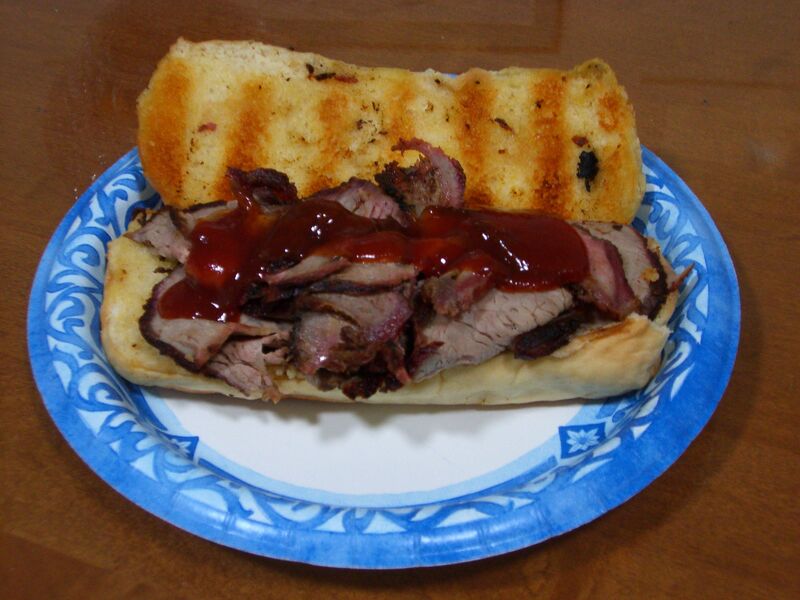 Nothing but tri-tip, sauce and bread. The three bbq food groups. They had a deal where you could get a sandwich, two sides and a drink for 8 bucks. So I decided that was what I would do. Just the sandwich is 6 bucks, but if I just had the sandwich I couldn’t really judge the place properly. I went with the chili beans and a garden salad as my sides. The baked beans looked like the pork ‘n beans that you get canned at the grocery store. The mac and potato salads were sitting in a dark deli case and didn’t look all that appetizing. I really would have rather had fries, but they didn’t have them on the menu. The chili beans were good, with little pieces of tri-tip, veggies and spices blended perfectly. It had a little spice, but nothing that was too intense. The garden salad was what you would expect, some lettuce, tomato and shaved carrot that I didn’t care enough about to finish. The first thing I noticed was how quickly my order was up. How on earth did they get that tri-tip off the grill and into foil so fast? Oh wait, is it possible my sandwhich had been sitting there for a while. Well, it was 3:30 in the afternoon so I guess they were done cooking for the day. Anyway, I grabbed my food and took a look at the seating area outside. It was pretty barren so I decided to just take my stuff to go. Plus, I almost ran someone over in the front of the restaurant because they have a driveway that goes nowhere right in front of their tables. Oops. I honestly can’t believe a senior citizen hasn’t driven into the building yet. Maybe that’s why they hid the sign. So I got the food home and busted out the sandwich. I loved the fact that the tri-tip was sliced nice and thin, however I was mildly disturbed by the fact that I could see the bottom bun of the sandwich. Being cheap with the meat is no way to make my hall of fame, guys. As far as taste goes, despite the fact it had been sitting a while, the sandwich was good. The meat wasn’t too dry and it had that burnt end taste on the edges that has a peppery bite to it. Combined with the sweetness of the sauce, it hit the spot. I preferred the regular sauce over the spicy (for once) and thought the bun had just enough garlic to it. The one other thing about the sandwich was that the outside of the bun was soft and the inside was toasted. I don’t know how you feel about this, but I enjoy the different textures in the same piece of bread. Plus it didn’t get all hard and brittle while wrapped in the foil. All in all, T.O. Meat Locker is fast and quality food. It’s worth the hype, but I wouldn’t get it this late in the day ever again. I can only imagine how this good sandwich could have been great. I think they were cheap on the tri-tip because they were trying to eek out the last batch of sandwiches for the day. Lesson learned. When I see bottom bun, it ain’t no fun. Pre-made sandwiches later in the day. This place is ghetto and I have had better sandwiches. I told Brian to try Spring Street Smokehouse in *ahem* Chinatown. They have buffalo ribs, which I have not tried.